Register your employment offers in an international platform and consult in real time the team members candidates corresponding to your research criteria. Plan many months in advance, or for some days according to your needs, thanks to a planning which you give in real time of the member’s availability and registered in Sylphair Aviation. The businesses globalization will leave behind all those who have not anticipated the constant growing of the businesses aviation world. Revolutionary, simple, fast, efficient, Sylphair Aviation. At any flight request, be always operational. Available professionals when and where you need them. Negotiate directly on the application with the candidates you have chosen. Without taking into account where you are, you can consult the employment offers. Upload your resume to our database in order to be hired more quickly. Receive alert messages once that an announce corresponds to your research criteria. Make yourself known after signing up on an international platform. Be among the first ones ready to take off. You have control of your career. Sylphair aviation was thought for all the professionals of the aviation. it is an international platform simple and efficient tool which can assure to answer your expectations in a very short time delay or if you wish to take your time. 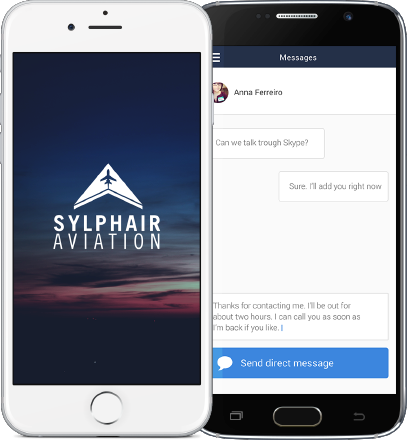 sylphair aviation is the tool you need. sylphair aviation is the link which was missing between the man and the machine. Copyright © 2015, 2016. All rights reserved.